Having a home birth in Alabama may soon be a lot easier if lawmakers give the green-light to a bill in the state House next week. HB315, which was introduced by Moulton-Republican state Rep. Ken Johnson in February, would decriminalize Certified Professional midwives and has been scheduled on Tuesday’s special order agenda. Currently, state law says it’s a misdemeanor offense to practice midwifery without a license issued by the state Board of Nursing and the Board of Medical Examiners. Meanwhile, midwifery is legal and regulated in 31 states, including neighboring states Florida and Tennessee. For women hoping to have a natural, home birth or for those without easy access to hospital with obstetric care, this reverse is policy welcome news. Opponents of the bill, claim passing it and having births outside of the hospital is a safety issue. But Kaycee Cavender, President of the Alabama Birth Coalition says supporting families during pregnancy and childbirth, disagrees. She says legalizing midwifery makes home births safer for both the mother and child. 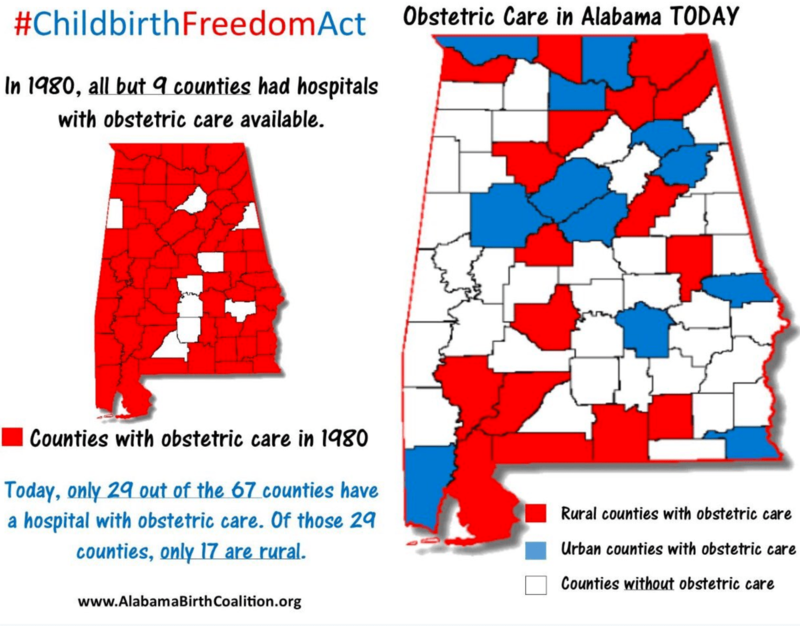 According to the Alabama Birth Coalition, only 29 out of the 67 counties have a hospital with obstetric care. Of those 29 counties, only 17 are rural. “It’s not society’s place to decide what’s right for each family. In order to make home births as safe as possible, we must legalize certified professional midwives — they’re specialists and experts in out of hospital delivery and care,” Cavender added. While Haley Pilgrim, a doula and mother of five from Leeds, has not had a home birth herself she believes having the option to have a safe home birth is all about personal freedom. While Pilgrim doesn’t plan on having any more children herself, HB315 is still personal — she wants to see the Legislature approve it not only women across the state, but also her own daughters. “I don’t plan on having any more children, but I want this bill to pass for future Alabama mothers- for my doula clients and my two young daughters who may one day give birth here,” Pilgrim added. At least one state lawmaker is already listening to voices like Cavender and Pilgrim’s and has taken to social media ahead of Tuesday’s vote to voice his support. Vestavia Hills-Republican state Rep Jack Williams said he’ll be voting yes on Tuesday Friday afternoon. #HB315 common sense decriminalization of midwifery is on the special order calendar Tuesday in the Alabama House . I’m voting yes.